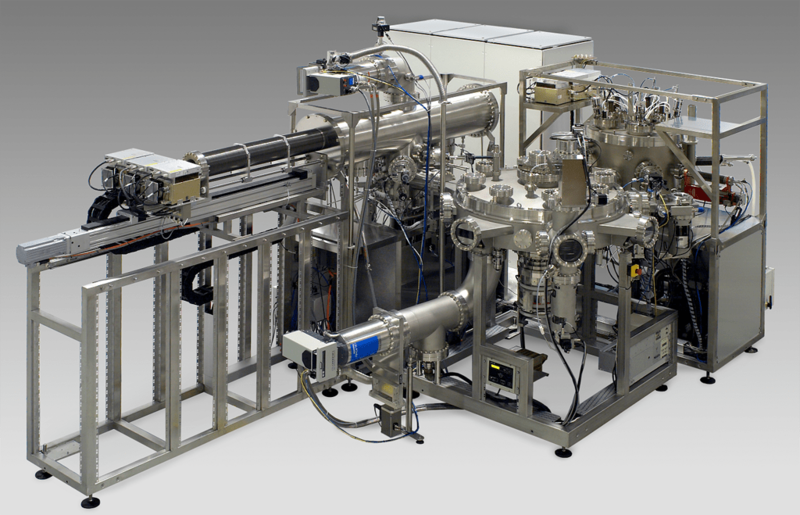 DCA designed in collaboration with Prof. Brian Hayden’s group at the Chemistry Department of Southampton University a special UHV deposition system based on the M600 MBE. The system is designed to carry out the synthesis and in-situ analysis of materials deposited on micro-fabricated screening chips. The source shutters are positioned to achieve a controlled gradient of the deposited elements across the substrate, and are fixed during the course of deposition. Choice of the shutter position and the rate of deposition for each source allow the direct synthesis of continuous and controlled materials of varying composition. The method not only has the advantage of speed, simplicity and with control of the compositional ranges, but the simultaneous deposition of the elements to form the material has a number of important advantages over sequential method. These include the synthesis if wide ranges of composition in non-equilibrium phases ideal for high throughput screening, and the synthesis of for example, mixed oxides, hydrides and nitrides. For further information visit Chemistry at Southampton University. Prof. Dr.-Ing. 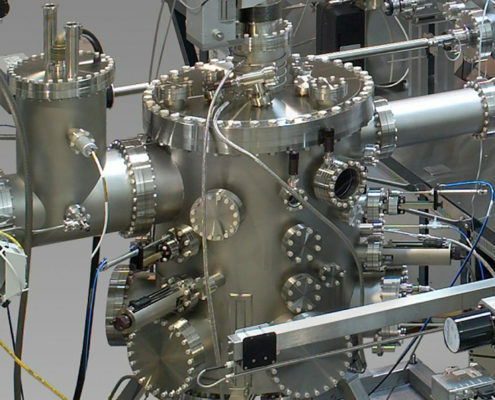 Alfred Ludwig’s group at the Institute of Materials of the Ruhr-Universität Bochum uses a unique cluster tool sputtering system with sequential and co-sputtering chambers connected to an automated UHV cluster tool. Prof. Ludwig’s research is based on the application of combinatorial thin film deposition methods and high-throughput characterization-tools. The group focuses on materials for microsystems (magnetic, shape memory) and materials for hydrogen storage.